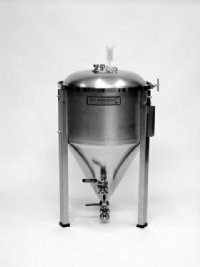 If you are interested in a commercial brewery fermenter but a bit smaller and at a consumer price these 7 gallon, 14.5 gallon, 27 gallon and 42 gallon stainless conical fermenters are what you are looking for. 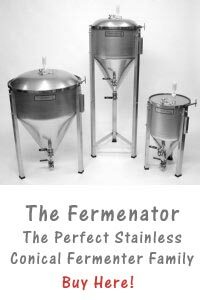 The Fermenator is what every home brewer is dreaming of, it is beautifully designed and it has the only weld free interior on the market. 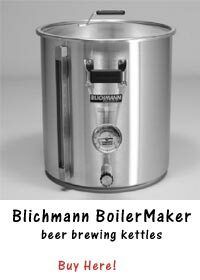 The Fermenators from Blichmann are available in 7 gallon, 14.5 gallon, 27 gallon and 42 gallon sizes. They are made from 100% stainless steel. The fermenator has one very big pro as opposed to other fermenters they are so called weld free. This means that the places where the fittings are coming through the surface there are no welds and they are totally smooth. This means that bacteria have no way to get stuck in the weld and that they are better to sanitize. The fittings can also be replaced which is something that is not possible with welded ones. Are these kind of fittings more expensive? Yes they are but it is well worth the money because a couple of batches gone wrong because of bacteria will cost you much more. Something else that is really cool is the rotating racking arm, until the fermenator only the professional stainless steel fermenters had such an arm. It is really quite handy that you are able to rotate it down until you get to the yeast sediment. The competitors of the Fermenator all have one big down side to it, the lid. The fermentor has a stainless steel hatch with a proper seal, this does minimize bacterial contamination and it makes it easy to access your beer to pitch yeast. The hatch is pressure capable, just like in the large breweries this means you do not need to elevate the fermentor above the kegs or bottling bucket. # Excellent product! I put off buying one but with the new domed lid design, I had to have one. # I have 2 of the 24 gallon units and love them. I rigged them with an internal coiling coil that is connected to a glycol tank/cooler with a pump and temp. control. Heaven in my garage. # yep – I love my conical. no complaints. I disassemble it (including the valves) once every 6 months or so for a deep cleaning, and no issues at all. I can’t imagine brewing without it and when I do have to use buckets or carboys (for my smaller batches of big beers) I remember how much I take it for granted.